This Extra Crispy Spicy Fried Chicken is sure to become a family favorite. Great for potlucks or any night of the week. When I saw that the “recipe” for this month’s Crazy Cooking Challenge was fried chicken I may have let out a little squeal. I will full-heartedly admit that fried chicken is my favorite food. God was in a very good mood when he gave whoever invented it the idea! I mean, it’s crunchy, juicy, greasy, salty…everything that is delicious and good in the world. As much as I love fried chicken, I very rarely eat it and never make it homemade. I pretty much never fry food at home so it is usually just an indulgence when we go out to eat. But I was more than happy to give it an attempt at home for the sake of the Challenge. Oh the sacrifices we make. I found a billion different blogger recipes I wanted to try but I decided on this Extra Crispy Spicy Fried Chicken because it was created based on Popeye’s Chicken and you just can’t go wrong with that. It’s my favorite of all the big fried chicken fast food chains. This chicken is everything the name promises. Unbelievably crispy with a kick of spice. It’s not a simple, quick process as it involves marinades and several dredges but it truly is worth the effort. It’s first marinated in buttermilk and hot sauce. The buttermilk keeps the chicken super juicy while it’s being fried. And the hot sauce adds the obvious needed kick for spicy chicken. Once the chicken has marinated, preferably overnight, it gets a dredge through seasoned, spicy flour then a dip in eggs and another coat of the flour mixture. This ensures a super thick, crunchy coating. And if you have time, let the chicken hang out uncovered on a rack in the refrigerator for a few hours before frying. This helps ensure the coating sticks to the chicken. Then after all that work you get to enjoy the deliciousness that is this extra crispy spicy fried chicken. And you might as well go big and serve it up with some macaroni and cheese. It’s just what’s right. 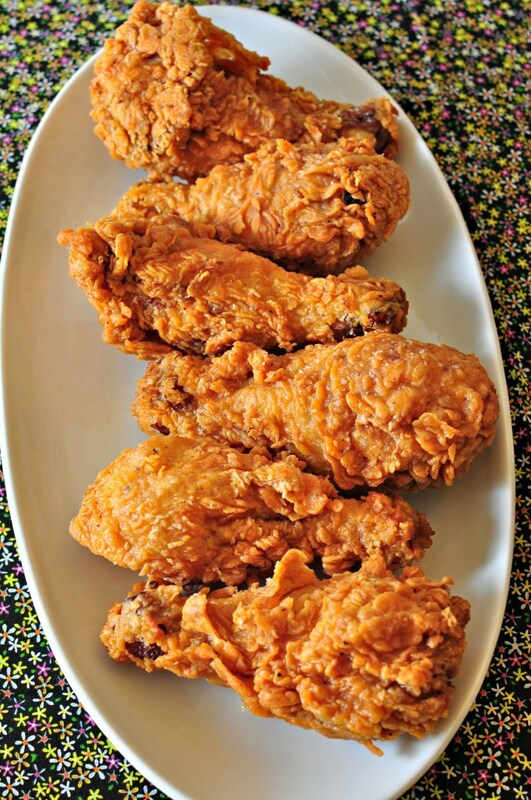 This Extra Crispy Spicy Fried Chicken is moist and tender from a buttermilk soak and extra crispy from a double batter. You won't believe the crunch. Place chicken pieces in a large bowl or ziptop bag. Cover with buttermilk and marinate 2 hours to overnight (this is optional but definitely recommended). Remove from buttermilk and pat dry with a paper towel. Sprinkle lightly with salt, pepper and garlic powder. Set aside. Place a rack over a rimmed baking sheet and set aside. Whisk together the eggs, water and hot sauce. In another bowl, whisk together the flour, salt, pepper, paprika and cayenne pepper. Dredge the chicken in the flour mixture then coat it in the egg mixture. Return to the flour mixture and coat. Place chicken on the rack. Once all pieces are coated, place in the refrigerator for 30 minutes. This step helps the coating stick to the chicken. Meanwhile, heat the peanut oil to 350 degrees F. Working in batches, fry chicken for about 15 to 18 minutes, or until no longer pink and cooked through. Keep in mind that dark meat will take a little longer to cook than white meat. Watch the wings as they may cook in less than 15 minutes. Place chicken on a clean rack to help keep it crispy as you cook another batch. What beautiful fried chicken! Gorgeous! Extra crispy and spicy sounds wonderful in my world. I too rarely fry so this challenge was a treat in our home too. I need this ….. looks so good! Pinned it! This is absolutely beautiful! My favorite part is the crispy skin, and yours looks amazing! I just want to peel the skin off your chicken and eat it for the rest of my life. I will have to come back to this recipe because I think Husband will really enjoy it. Oh my goodness! This loks so incredibly crunchy and delicious! Great SRC pick! My husband says Popeyes chicken is the best food in the world, lol. I look forward to making this with him. Oh, it was! I prefer Louisiana Hot Sauce so that is what I used (but you could use Franks or Tabasco too). Hi Kelly! It’s mild. A little spiciness comes through but definitely not overpowering. Hope you enjoy it!! A buttermilk soak is not optional if you want your chicken to be juicy and tender. I don’t use any eggs. I put hot sauce, salt, sugar, and pressed garlic right in the buttermilk and let the chicken soak in that overnight, so it’s basically brined in buttermilk, then the chicken goes into flour seasoned with sweet paprika, cayenne, and fresh ground black pepper. I let it sit in the flour for about 45 minutes before frying, because it will cook more evenly if it’s not as cold, and the breading adheres better if it sits (the flour absorbs the liquid). You can leave it in the flour or put it on a cooling rack for that time, but it makes a difference in the final product. The other trick is to never let your oil drop below 375. If the oil isn’t hot enough at any point, the chicken will be greasy. I tried cooking it at 350* but 15-18 min. wasn’t enough to get the dark meat done. I ended up burning the skin! BUMMER! I even used a thermometer to be sure it didn’t go over the recommended temp. Maybe letting it sit and warm up to room temp is the key! By the way, I didn’t have buttermilk so just used regular milk. It was juicy and tender, just a little burnt on the coating. I also omitted most of the hot ingredients, just went light on the pepper, paprika and cayenne. Telesma commented on 12,11,12 @ 8:30 that the oil should be 375 degrees, and once she floured the chicken she let it sit about 45 min.before frying, I haven’t tried this recipe yet so I’m reading the comments to get other folks opinion and the outcome of the final product,and take all of the comments into consideration, hopefully that my end results turn out delicious. your comment was helpful. It helps the flour stick to the chicken instead of falling off when you fry it or bite into it. Thank you so much Telesma, your comment has been very helpful. I’ll be making this soon, hopefully it turn out delicious. Is it necessary to cook in peanut oil? It isn’t absolutely isn’t that you fry in peanut oil it is just the prefered oil as it neutral and won’t impart any flavor on the chicken. It also has a high smoke point so it can be brought to a higher temperature. I have used veggie oil in the past with good results. Chicken looks amazing….. For those who are interested, here is a link to a demo video on how to cut up a whole chicken into pieces…. When I worked at POPEYE’S ,the spices were added to the flour.I prefer to buy it from Popeye’s, I don’t like when the ends bleed, and grosses me out. Did popeyes do an egg wash or just flour to fry the chicken? I am not sure what process Popeye’s uses for their fried chicken. Awesome! It’s so good! Hope you enjoy it as much as we do! Could I use boneless chicken breast instead??? You could definitely use chicken breasts instead but it will dry out faster so be mindful of that. Also, since it doesn’t have the skin, it may not get as crispy. Would the frying time change with boneless chicken breast? Yes, they would take less time to cook. It depends on how thick they are, but I would say 3-4 minutes per side. I love Popeye’s spicy chicken!! There’s no Popeye’s where I live so it’s on my list of places to visit when I’m home! I will definitely be trying this recipe soon! Thanks for sharing it! I tried this recipe tonight, and for the amount of work & mess involved I didn’t think it was that great. It was OK, and the hot sauce gave it a nice subtle flavor, but it was mostly pretty bland. If I made it again I would at least add some salt or something to the flour mixture. I expected it to have more of a kick, and even though I thought it wasn’t too bad I definitely wouldn’t make it again. Thanks for the feedback. I’m sorry you didn’t enjoy it as much as you had hoped. There was salt in the recipe…. Did you use a deep fryer or just a deep pan for frying? I’m using legs for this and just hope to be able to cook them thoroughly while not burning the outside. I used a deep pan and flipped them halfway through the cooking process since the oil didn’t completely cover them. I used this recipe to make chicken tenders, and it worked perfectly!!! I just made this but using boneless chicken breasts instead for spicy chicken sandwiches.. Came out fantastic! They tasted great and cooked relatively fast. I high recommend this recipe. I pinned this recipe almost a year ago and never managed to find the time and patience to try it out. Until today. I like ur recipe and blog. Its very easy to understand ur way of cooking way. Thank u !!! Peanut oil is usually recommended for frying because it has a higher smoke point and the “flavor” of it goes well with fried foods. That being said, no you don’t have to use peanut oil. Vegetable or canola oil would also work here. I haven’t tried baking it but it’s worth a try. I would cover a baking sheet with foil then place a wire rack with nonstick spray on top. Then place the chicken on the rack and spray generously with olive oil spray (or brush lightly with some melted butter) then flip and spray again halfway through baking. Bake at 400 degrees for about 45 minutes. Let me know how it turns out if you try it! It looks amazing! I’m am going to make it today. I do have one question though, I am wondering what it means when it says cut chicken. Are we supposed to cut it? When it says cut into pieces, it’s referring to a whole chicken so you would cut the legs, breasts, thighs, etc. If you bought a chicken already cut then no need to do anything. Hope you enjoy the recipe! We just ran across this recipe and Hubby is trying it out! He added a little more Tabasco sauce to the Louisiana sauce to give it more of a spicy kick to it. We will see how it comes out!! SO excited, have never eaten Popeyes before so, this is as close as I have gotten to eating it haha. We will update when we finish eating xD thank you!!!! This recipe is perfection. Super crispy and delish! I soaked thighs and legs in buttermilk overnight. Exceeded my expectations. This is now my go to fried chicken recipe. Thanks! hi! I’m so looking forward to trying this recipe tonight. Just a quick question what did you do with the chicken that was already cooked? Did you keep it in the oven on warm? Or will that dry out the chicken? Thanks? It would be perfectly fine to keep it in the oven on warm while the remaining chicken cooks. Let me know what you think. Thanks for stopping by and commenting. I placed mine from the pan to a cooling rack. It stayed hot sitting out for around 20 minutes. Breading was crispy! Made this recipe tonight. This was my first time frying chicken and it came out amazing! Thank you! Also, I didn’t have buttermilk or regular milk so I combined soy milk and lemon juice to make a substitute. Chicken was moist and tender. I would recommend lightly seasoning your chicken, including the hot sauce, before adding the buttermilk. What if i can’t handle the spicy???? is there a substitute for flavor??? or can i skip it altogether??? Hi Jade! You can just leave out the hot pepper sauce. You will probably want to double the eggs and water though to make up for the lost liquid. Hope you love it! Can I put them in the oven rather then deep frying ? I prefer not deep frying and was hoping another option? I’ve never tried baking it but you definitely could try! I would recommend melting some butter in a 13×9 pan then tossing the chicken in the melted butter than bake in that same pan at 425 degrees for 45 minutes, turning after 30 minutes. If you try baking it, let me know how it turns out! Good luck. can i use this batter for fish as well? I think it would be great for fish! You could use normal milk but the buttermilk really helps tenderize the chicken. Whenever I have used buttermilk to soak the chicken the fried coating came off in one bite so I now rinse off buttermilk and double bread with egg also I always put salt in cooked chicken so I will not miss flavor I love frying and lots of spice so will increase hot sauce hope it works. You have a beautiful family I am a lifelong bachelor I envy you God bless you. I made this and it came out just like the photos! I made a few changes. I did not have buttermilk so substituted a quarter cup of milk with 3/4 plain yogurt and tossed it with the chicken overnight. I did not wait 30 min for the flour to coat. For the chicken sides I made creamed spinach and mash potatoes with a homemade beef based gravy. Delicious. Thanks again for the wonderful recipe!! So glad you loved it Joanna! Great substitution too, I don’t usually have buttermilk so it’s good to know that works as an option. Thank you! It looks beautiful out of the deep fryer and husband approves. I cut back on spicy a bit and used boneless-skinless breast for a chicken sandwich. I refrigerated for about an hour after double breading, but the breading still slid off while he ate it…but otherwise he likes it. I’m vegetarian so I just take his word! I just made this with Schår’s mix B gluten-free flour and it was absolutely delicious. Being a coeliac, I haven’t been able to enjoy fried chicken for years. Oh this makes me so happy Carol Lynn! Glad you enjoyed something you haven’t been able to in years! Thanks for stopping by and commenting! Oh no! Glad your second batch turned out better! I have been using only this recipe for fried chicken for about a year and a half now if not longer. It’s so good but I rarely make it because it’s a little time consuming. I usually fry it in coconut oil and then let it finish in the oven. I add salt, pepper, and extra paprika and cayenne to the flour. Also extra hot sauce to the buttermilk and the egg mixture (it doesn’t turn out too spicy for my family). I have even made these for my cousin in laws and their 6 year old daughter. She ate about 5 pieces all by herself and her mother asked where I bought it from and couldn’t believe it when I told her I made it. My boyfriend loves it so much he wants it this Valentine’s day which is why I’m finally commenting! I’m so glad to hear you all love this Mikayla! Thanks for stopping by and letting me know! And fried chicken for Valentines Day is GENIUS. I may have to follow suit. I loved the flavor but it didn’t work out like I hoped… and I know it was errors on my part. I soaked the chicken over night, double dredged it, let it sit in the fridge for 30 minutes. I tried pan frying it, which started great, but my oil got hotter than 350 quickly. How do you maintain 350 while frying it? I have never had luck of frying chicken and fulling cooking it, without having to bake it too 🙁 Do you have any tips to prevent the oil from getting so hot? Also, when I took a bite, all the skin/breading fell off. So I must have done something wrong. I love the flavor though. I’m going to try it again for sure, until I get it right. Oh I’m so sorry to hear this Craig. It’s disappointing when a recipe doesn’t turn out like you hoped but thank you for your kindness and I love your positive attitude about giving it another try. In terms of keeping the oil from getting too hot, I keep a thermometer in the oil and bump down the temperature on the stove top if it gets too hot. It’s tricky since the oil temperature usually dips lower after adding the chicken. As for the breading falling off, I would try patting dry the chicken after removing it from the buttermilk soak. This will help the initial coating of flour stick to the chicken better. If it’s too goopy at the start, it is very possible it will slide off. I’m going to update the recipe to state this as well. I’m so glad you’re going to give it another go, it’s a really tasty recipe. Thanks for reading, stopping by and commenting. Good luck! Hi Meg, would these be OK to cook in a deep fat fryer rather than a pan of hot oil?. I have a kind of fat fryer saucepan for deep frying.. Also have no way of gauging the temp so guess just have it as hot as I can on the stove. Looking to do these tomorrow, so any help would be much appreciated. Hi Scott! Yes, you can definitely cook them in a deep fat fryer. For my stove, for pan frying at least, I have to have the heat around medium high to reach the required temperature. A good way to test if it’s hot enough is to drop in a pinch of flour. If it sizzles right away, it’s ready. I’d say probably around 12 minutes for legs, thighs and wings and 15-20 for the breasts. Hope you love them!! If you have any other questions, don’t hesitate to ask. What can be done with the leftover buttermilk?? Pour it out. You don’t want to reuse anything in which you have soaked chicken. Yes, I second Sadie. Since the raw chicken was marinating in the buttermilk it shouldn’t be used. I saw you said you could use a deep fryer. Would you still recommend the time still be 15-18 minutes at that temperature? Every time I try to fry chicken the outside burns and the inside isn’t cooked! Help! Hey Michelle! I would still recommend the same time for deep frying. If it’s looking too brown (and isn’t cooked through) you could remove it from the fryer and place it on an oven safe rack with a baking sheet underneath and bake it for a few minutes at 400 degrees until it reaches the proper temperature (165 degrees F).